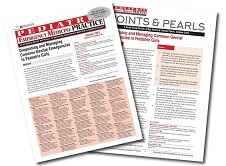 CME: This issue includes 4 AMA PRA Category 1 Credits™; 4 ACEP Category I credits; 4 AAP Prescribed credits; and 4 AOA Category 2-A or 2-B CME credits. CME expires 10/01/2021. Included as part of the 4 credits, this CME activity is eligible for 2 Trauma CME credits, subject to your state and institutional approval. The presentation of genital injuries and emergencies in pediatric girls can sometimes be misleading. A traumatic injury with excessive bleeding may be a straddle injury that requires only conservative management, while a penetrating injury may have no recognizable signs or symptoms but require extensive surgery. 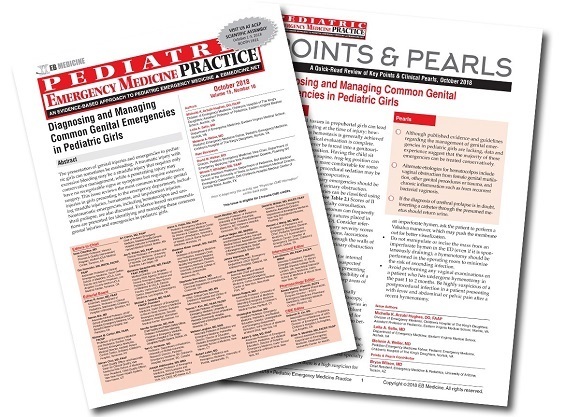 This issue reviews the most common traumatic genital injuries in girls presenting to the emergency department, including straddle injuries, hematomas, and impalement injuries. Nontraumatic emergencies, including hematocolpos and urethral prolapse, are also discussed. Evidence-based recommendations are presented for identifying and managing these common genital injuries and emergencies in pediatric girls. A 15-year-old adolescent girl is brought into the ED by her mother for severe abdominal and pelvic pain with dysuria. The patient is otherwise healthy, with no significant past medical history. She is not sexually active and denies any trauma. Upon questioning, the patient states that she has had cyclical abdominal pain over the past year and a half, which typically lasts 2 to 3 days, and then self resolves. She has not yet started her menses. This is the first time that the pain has been 10/10 in severity, and she has new urinary urgency, with inability to fully empty her bladder. On physical examination, she is Tanner stage V for breast and pubic hair development, her abdomen is soft with no palpable mass, and she has no costovertebral angle tenderness. On visual inspection of her perineum, she is noted to have a large, bulging purplish mass in her vaginal area with a small leak of blood. Are there any laboratory tests that you should order? What imaging—if any—would be the best choice for confirming the diagnosis? Should you try to release the pressure and evacuate the blood? Your next patient is a 3-year-old girl who has come in for fever. Two days prior, her brother had injured her with a coat hanger while playing “swords.” According to the patient’s brother, the coat hanger had gone into her “bottom,” but he removed it. Since she had no bleeding or obvious injury, they thought it was okay not tell their mother. During the physical examination, the girl has no abdominal tenderness with palpation and no bloody drainage on limited visual rectal examination. You begin to consider how you should manage this patient. Is her fever related to the injury, or is this a viral illness? Would laboratory studies be helpful? What imaging would be best for evaluating her potential injury? Excellent pictures and diagrams. Thorough review; especially helpful for general EM physicians. Very well written article with practical advice on the treatment and disposition of hematocolpos and urethral prolapse. Excellent summary with pertinent information. This article made me aware of hematocolpos and urethral stricture and discussed the treatment and disposition of this patient, also made aware of penetrating pelvic injuries and the need for CAT scan or MRI to further evaluate. Also discussed the importance of the pelvic examination and suggested the use of ketamine for adequate evaluation. After this course, I plan to be more thorough in evaluating the genital region of pediatric female pts who present with complaints of abdominal pain/pain on urination/vaginal/perineal pain. This was an excellent evidence-based approach to the pediatric patient with gynecologic emergencies. I will remember to consider hematocolpos for adolescents with chronic (intermittent) abdominal pain. This improved my recognition and management of traumatic genital injuries in girls.